Some places pull me towards them even when I’m planning on going elsewhere. Glen Feshie is one. I end up camping there half a dozen times most years, often on trips where I’ve definitely been going to go somewhere different. But the beauty of the glen just draws me in, sets my feet on that familiar path leading me deep into the forest beside the rushing river. 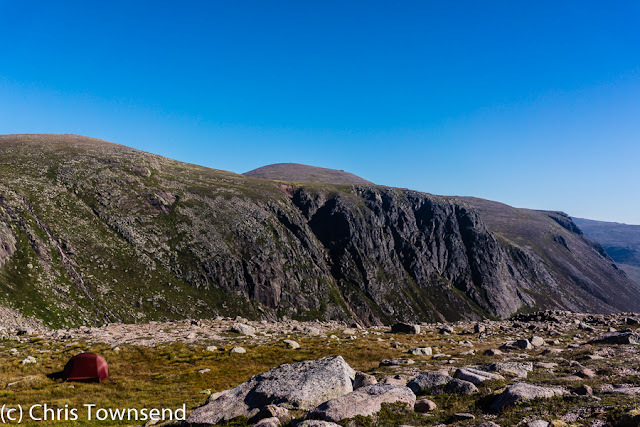 Another place I can’t seem to escape is the curving edge of the Cairngorm Plateau where, amidst a complex tangle of boulders and slabs, the waters of the Feith Buidhe and the Garbh Uisge Beag speed up and begin their splendid tumble down into the corrie far below. Last summer I wandered here yet again, drawn by the desire to once more look down on Loch Avon, stare at the great crags of Stag Rocks, Hell’s Lum and Carn Etchachan, and walk the granite slabs beside the tumbling streams and the summer snowfields. 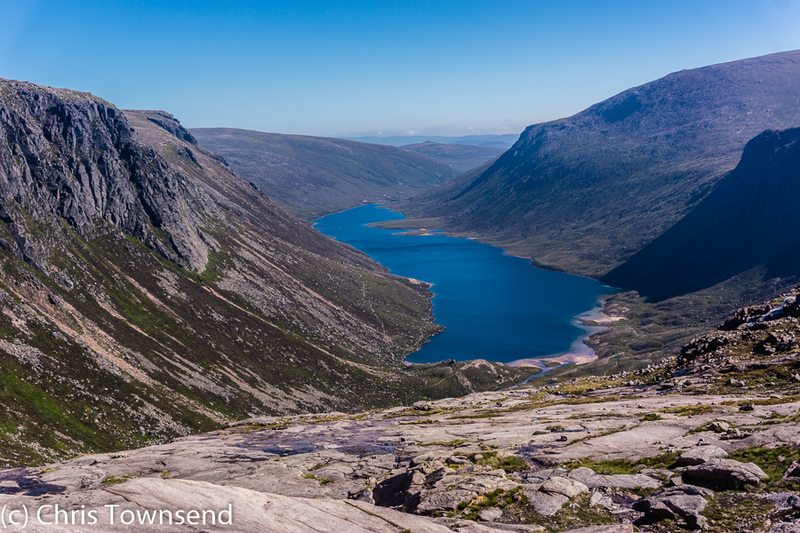 I’d set off with the intention of visiting Loch Avon and then climbing up onto the long stony summit of Beinn Mheadhoin, where I’d never camped before. But when I reached the start of the descent from Coire Domhain to the head of the loch I felt a reluctance to go on that was almost physical. 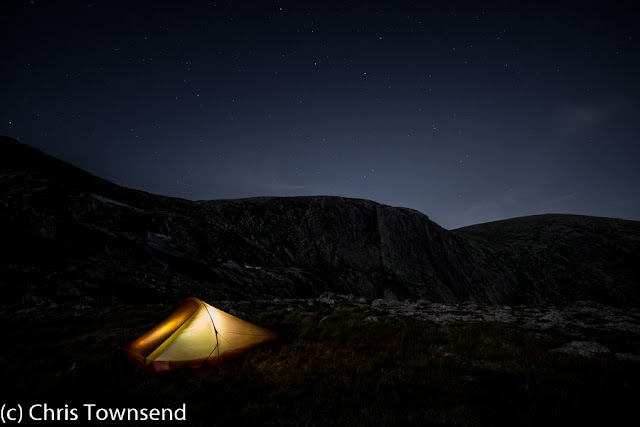 In my mind I began to justify changing my plans – ‘it’ll be midgey down there’, ‘it’ll be hot on the climb up to Beinn Mheadoin’, ‘I’ll have to carry water to camp’ – but I knew that none of these were the real reasons for my hesitation. Rather it was the closeness of the Feith Buidhe and the Garbh Uisge Beag. Just round the top of Hell’s Lum and I’d be there, in that magic place. I stopped and waited, poised on the first steepening of the path that led down. The feeling grew stronger that what I really, really wanted to do was turn away and head for the familiar. Resisting seemed useless. I looked up not down and set off round the edge of the Plateau. Immediately I felt relaxed. This was right. Soon the Feith Buidhe appeared not far below, a gentle slow stream here. 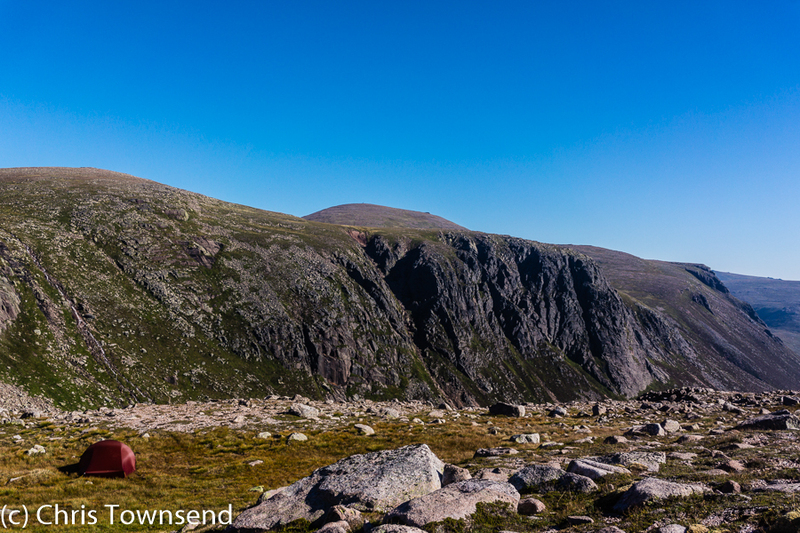 I crossed on boulders and ventured down towards the Garbh Uisge Beag. This is big jumbled country, a maze of grassy ledges, little crags, dark pools, and trickling rivulets – a mountain labyrinth. 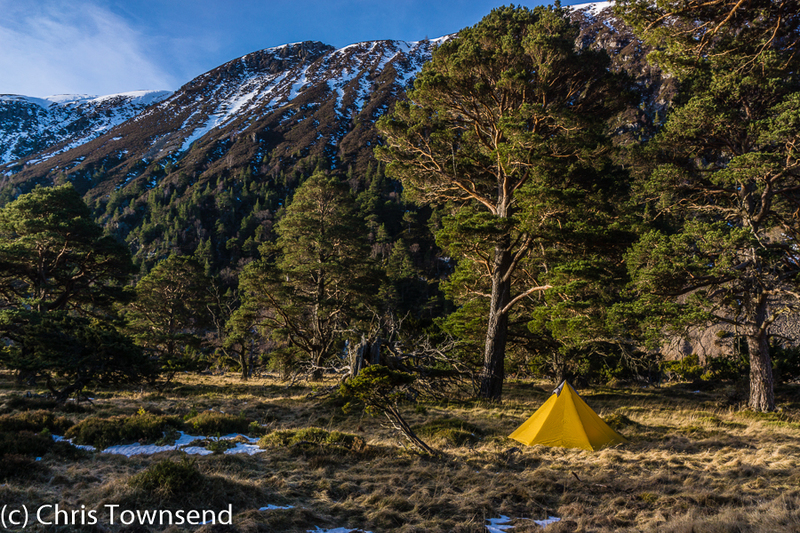 Although I’ve camped here many times it’s never been in the same spot – indeed I probably couldn’t identify most of them. On this occasion I found a good site on a patch of rough grass with just enough soil to hold pegs – many apparently good sites are actually too stony for tent or tarp though fine for a bivy. It being summer I wasn’t risking the last though. Not because of rain but because of midges. There was a breeze but I knew that if it eased the midges would appear, even up here at nearly 1,000 metres. As always my camp here was glorious. Big snow patches dominated the view, harshly bright in the sunshine and then cool and glowing under the moon. The night was warm and the moonlight enough for wandering around without need of a headlamp. I felt at home, relaxed, glad to be here. It had been the right decision. Dawn came suddenly with the rising sun making the tent unbearably hot. I cooled off by clambering over the slabs and venturing a little way into the dark passages between the rocks and the snow, which in places was well over head high. Then I sat in the sun and just looked, revelling in the land. The strong desire that had brought me here held me back from leaving. 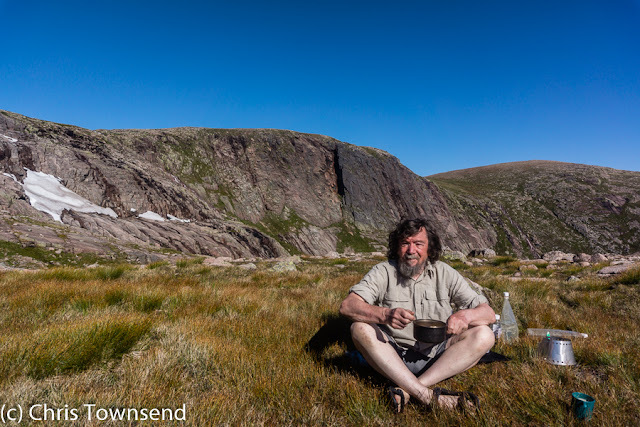 I was only out for one night though so eventually I tore myself away and headed up onto the Plateau and back to the tame side of Cairn Gorm. I’ll be back this autumn. And this winter.